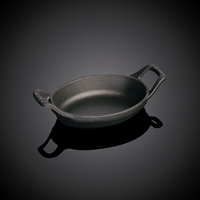 Alfi has a range of kitchen cookware for a wide variety of applications, from mini Dutch ovens to high-grade stainless steel skillets and frying pans. When you are looking for professional cookware for your kitchen, you have come to the right place. Alfi carries only the best and hardest-to-find cooking sets for any kitchen by top brands such as All-Clad and Staub. Our discerning selection of pots, pans, and skillets are second to none. Our prices are highly competitive and we offer fast shipping on all our products. Looking for more information, feel free to send us an email or call us at (800) 288-2534 and we will be happy to answer all your questions. 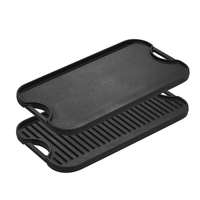 The Lodge 12 inch Pro-Logic style pan features a more modern design with updated handles and sloped sides, but still offers the timeless function for which cast iron is known. If you are entertaining or have a large family, the 12 inch seasoned steel skillet has you covered. Big enough to sear multiple steaks or toss a ton of pasta, it is sure to please the crowd. Sleek American-made All-Clad cookware uses a unique bonding process which combines metals with different properties to produce ideal cookware. For example, All-Clad pans bond pure aluminum or copper cores (for quick and even heat distribution) to stainless steel (to prevent rust, corrosion, and heat conductance to the handles). These qualities combined with All-Clad’s proprietary Excalibur non-stick system create the perfect cooking surface equal to the finest professional cookware. It’s easy to fill out a kitchen with a stainless steel cookware set from All-Clad. 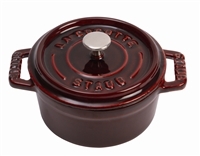 We also offer the best cast-iron cocottes and roasting dishes from the rustic French manufacturer Staub. Staub’s heavy cast iron cocottes are amazing because they look beautiful forever and can brown and self-baste food like nothing else in this world, for optimal flavor and tenderness of roasts and stews. Staub makes their cocottes even better through enameling to provide added resistance cracks from thermal shocks and scratches.